When it came to the “Battle of the Bastards” last week, I wrote that for all the spectacle Game of Thrones could muster in its sixth, ungodly-funded season, the end result felt linearly like the only direction story could proceed with, shaded only by which, if any characters ended up dead in the process. The same more or less holds true for “The Winds of Winter,” even if the getting there felt vastly predictable for very different reasons. 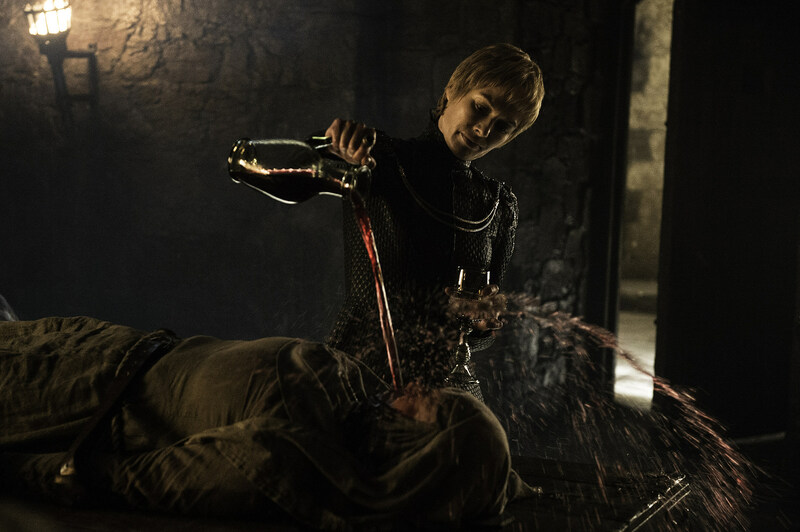 In truth, it’s a consequence of devouring and dissecting these shows before the writers themselves can realize their biggest reveals have been crowdsourced, however more effective moments like Cersei’s wildfire triumph feel over the victory last week. I mean, of course Cersei would blow up the Sept of Baelor (they only mentioned wildfire in the city 50 times), leaving the only question who might get caught in it. The prevailing story engine this season seems to have been clearing all extraneous pieces off the board, so it makes a mechanical kind of sense for Cersei to eliminate any possible continuance of Kings Landing’s royal and spiritual infighting, Tommen serving as an unfortunate* side effect of that. And while she never quite sought it, Cersei seems more than ready to ascend that iron throne in her svelt new Mockingjay-number, while I do wonder what she looks like as a remorseless** leader, no longer weighted by the humanity of protecting her children. *Again, the use of wildfire was made explicit enough with numerous callbacks throughout the season, but how, and why Tommen leaping to his death leaked, I may never understand. This had been taken as fact by Reddit circles from the outset of the season, and while it makes equal sense to sweep Tommen off the board with the others, the actual prediction of his end was frighteningly specific. **Furthermore, I appreciated the detail of Cersei wanting his body burned, not needing to see the golden funeral shroud that Maggy the Frog predicted. Not to mention, she'd already poured one or two out for him. There was a tremendous amount to take in this week (thank you 69-minute runtime, no thank you Sam goes to Brazil), but I’d be remiss not to mention the seemingly-confirmed “R+L=J” theory, itself more or less the only explanation of Jon’s origin that ever made sense. “The Winds of Winter” itself didn’t make much explicit beyond Jon as the daughter of Lyanna Stark, certainly not the nuances of Robert Baratheon wanting to kill him for his Targaryen blood, or what that might mean going forward. “Winter” treats it largely for the audience’s benefit, sans any real reaction from Bran, or any sense of how Jon’s lineage might play a factor going forward. That’s an important consideration, given the scenes at Winterfell seemed to tiptoe around a possible conflict of leadership between Sansa and Jon, itself the kind of plot point Kings’ Landing’s fiery end took such pain to wash away ahead of the series’ endgame. It’s an interesting change for Jon, to embrace a “King in the North” mantle while Sansa and Littlefinger share an additional layer of contempt, but the most we walk away with is a sense that Littlefinger’s inflamed sense of rejection will come back to haunt us. The same could largely be said of Davos confronting Melisandre for her crimes, as while Jon shows some growth to not follow Stannis in falling under Melisandre’s thrall, the red priestess seemingly has no other stake in the game but to return. "Anyway, real quick, I'm like 400." You’d think the Lord of Light would serve an even more important purpose now that Daenerys has finally set sail for Westeros, itself another incredible visual fans have waited years and years to see realized. I question if perhaps Season 7 will find another means to delay her, perhaps engaging the forgotten Euron* on the high seas, but at least the process of getting to that moment felt extremely earned. Likely the most effective emotional pairing of the night belonged to Tyrion and and Daenerys, the former finally a changed man with something to believe in, nearly moved to tears at having earned back his position as the Hand. The whole of Daenerys' exit from Slaver’s Bay the Bay of Dragons and Tyrion’s ascent marks the culmination of years’ worth of storytelling, as well as a stunning image for the season’s end, brimming with as much light and hope as there was darkness permeating Cersei’s coronation. *Let’s see if we can count runaway Season 6 plot points, between Euron, Jorah, Pod and Brienne, anyone left at Castle Black, Sandor and the Brotherhood Without Banners. It also made sense to keep Dorne to a minimum this season, offering a wonderful payoff Lady Olenna dismissing the Sand Snakes, and seemingly throwing in** for Daenerys. While we’re at it, Arya magically made it to The Twins for some Frey Pie and shrug-worthy vengeance on Walder, while Sam and Gilly … seem pretty well-removed from everything else of note. **In first viewing, I did not at all catch that Varys was back with Daenerys (and multiple Dorne ships) for the fleet. Talk about speedy travel this season! Ten bucks he brought the Sand Snakes with him, the jerk. It bears repeating that while Season 6 marks our first real year “off book,” we still don’t have much real insight into which, if any of these climactic events were guided by George R.R. Martin’s ultimate endgame, which itself could prove more important than we realize. I happened upon an earlier scene from the Season 3 finale this weekend, fraught with tension between Tyrion and Tywin debating the intersection of power, family and responsibility, exactly the kind of philosophical rhetoric that felt absent from Season 6’s bigger moments. We’ll never really know what characters like the High Sparrow or Margaery felt in their final moments, and lessons learned from a wasted lifetime of political maneuvering, So many years of story value simply washed away for an encroaching endgame. In a way, Daenerys even said it herself, that for all the implication of parting ways with Daario, she felt little more than relief and anticipation for what comes next. The art of discussion feels somewhat lost in these latter seasons, in a way that often leaves the spectacle of wildfire explosions and a dragon-backed fleet somewhat hollow. Now that Season 6 has so thoroughly cleared the board at least, maybe we can concentrate on restoring that function with the characters we’re closest. Aww, the Stark sigil reclaimed Winterfell in the opening credits! Definitely loved the specificity of everyone getting dressed for the trial (I wondered perhaps if Cersei’s outfit was armor, incase the trial didn’t go her way), as well the Leftovers-esque music underlaying it all. You’d almost forget that Pycelle died in the midst of all that, but I’m too busy booping Finn Jones on the nose for him thinking he’d fooled anyone. Was there something specifically horrifying about Zombie Mountain’s face that I missed? Looked like him, just purple-r.
Margaery and Hodor might be the only characters this season I’m legitimately sad to say goodbye to. Stilllll keeping some vague hope for the Blackfish. Game of Thrones knows better than to kill characters offscreen with no evidence thereafter. Seriously, where do Sam and Gilly go from here? Only two seasons left, so is the most we can hope for Sam comes rushing in with some urgent Night King factoid he learned at the library? 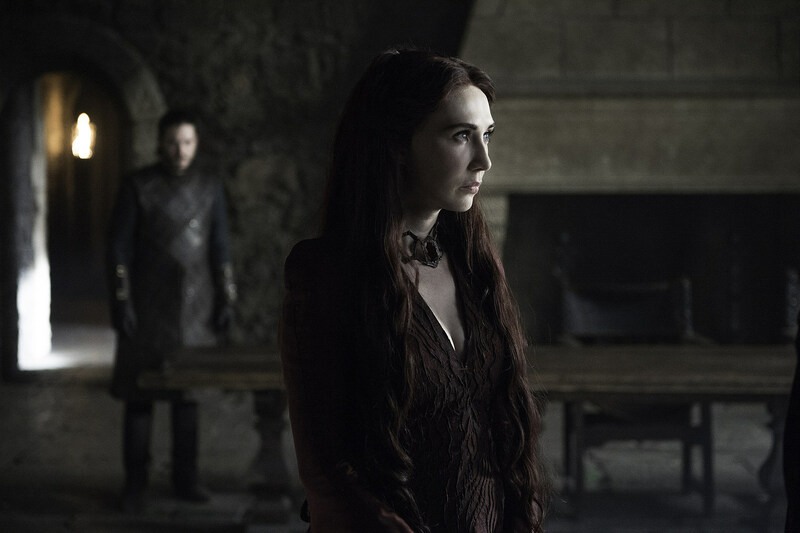 So, where should we bet on Melisandre popping up next? I’ve got 10-1 on Arya, given she said they’d meet again, but would also be interested in her joining Cersei. Heck, bring Arya along, it’s on her list! This week in confusing Game of Thrones geography: Olenna both learns of the Sept explosion and makes it to Dorne, while Sam still thinks Jon is Lord Commander. Sure, no one’s sending him ravens, it’s just a striking thing to have never caught up on. Anyone else disappointed Yara didn’t step out in a robe once Daario finally left? Incidentally, was anyone else catching a few lovelorn Jorah vibes from Tyrion? Doubly-Stark-spurned Littlefinger is going to Mess. Stuff. Up. Bye, Benjen/Coldhands! You were weird, and given almost as little consideration as your first appearance. To be real, kinda disappointed in Lyanna Mormont taking Jon Snow’s side over Sansa. She was the one who saved the day! Unspoken, but I loved that Nikolaj Coster-Waldau got to play both the shock of seeing Cersei on the throne, as well its implication for Tommen’s fate. 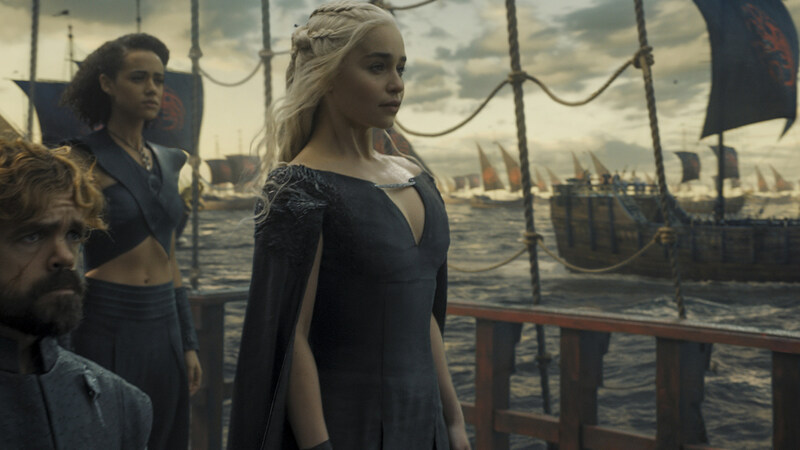 Game of Thrones will return to HBO in 2017, but beyond that remains to be seen.